There’s something about traveling where after a while you start to miss the flavours of home. It’s been about a week in Barcelona and I’ve had some of the best food here…Botafumeiro was awesome as usual and the little shops with tapas and other kinds of Spanish food have been great. 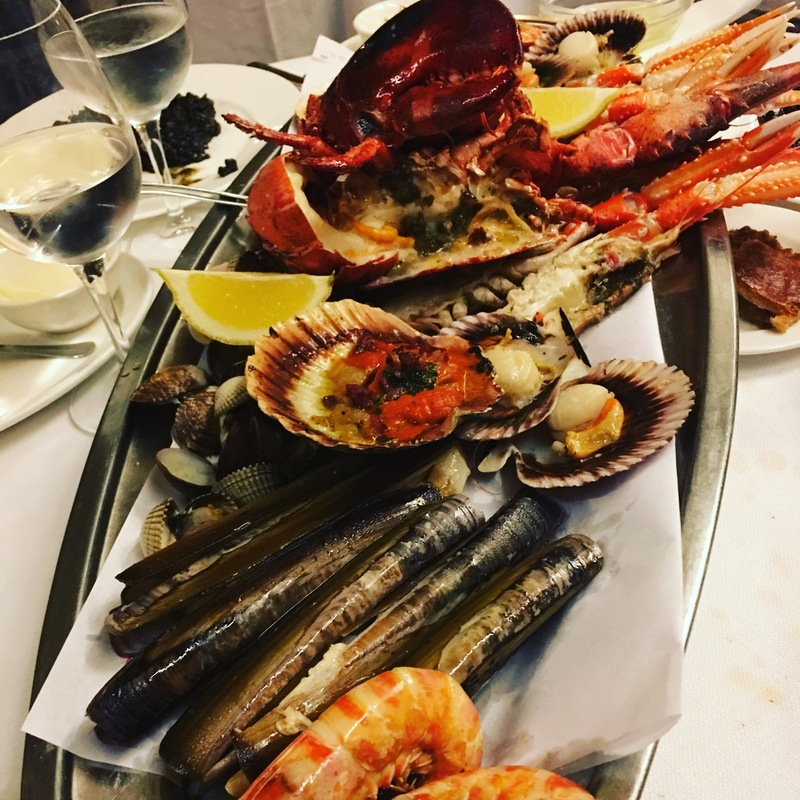 From Botafumeiro – now that’s what I call a seafood platter! I think the food experience has been much better than in Greece just a month ago, where after a week the constant diet of souvlaki and Greek salads was just wearing me down. The Spanish experience has been much more positive, maybe because of the variety of food available. But there is something about comfort food and home that calls out to me and that is why I always travel with my mini electric cooker, Zyliss knife and chopping board. 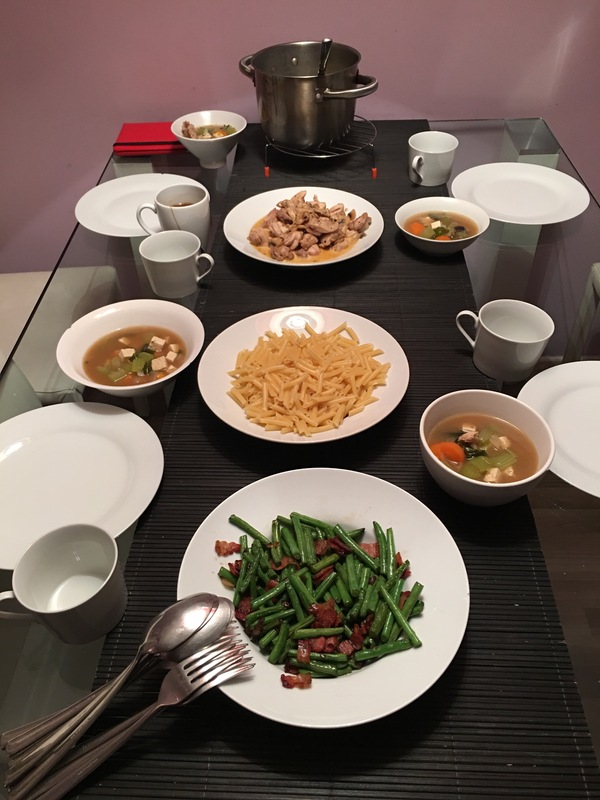 It also helps me to cook fresh for at least one meal a day, with a dish that is truly from home. When I first went on a low carb diet, one of the things I instantly and desperately missed was Chinese rice porridge or congee. This is fundamental to any Asian belly and in fact in any hotel breakfast in South East Asia, there is always a congee corner where you have a range of garnishes to add to plain or chicken congee. This congee has also always been my go to when my tummy feels unsettled and I need something light or comforting. There is absolutely nothing fancy about it; but just having it gives me a sense of wellbeing and solid security. When I was a kid, I had a book of stories, the first of which was about the Magic Pot. This pot could apparently cook porridge automatically but had to be stopped with the words “stop, little pot, stop”. Of course the day the password was forgotten by the little girl’s granny, the pot overflowed to flood the village, and I was as always intrigued by the picture of little kids by the roadside, armed with spoons and scooping up gruel to eat. It was only much later that I discovered that this gruel was not my favourite congee (as I imagined it) but actually oatmeal (yuck). It was when I was a teenager when our family moved into a large bungalow manned by 2 “Ah Ma Cheh”, the traditional maids from China who wore a quintessential white qi pao top and black pants, that I discovered otherwise. These 2 old ladies (who were already ancient when I got to know them), had been serving in a typical British household since they were young girls, and between their broken English and my hopeless Cantonese, we barely understood each other. One day I was ill and I asked for porridge – I nearly fainted when I got oatmeal instead; the last thing I would ever eat to save my life. Later, they tried to save the situation by making me minestrone soup…but it was a mildly traumatic experience for me as a shy teen who didn’t know how to explain what I wanted. Anyway those 2 redoubtable old ladies eventually retired home to China and I’m pretty sure are long gone already…but that experience left a mark on me…in any country that I don’t know the language, I will always have enough vocabulary to say hi, thank you, ask for the toilet and the names of food to order. Survival is deeply ingrained in my language structures! Anyway this time in Spain, hubs got an apartment with a fairly functional kitchen – because of jet lag we started off making a large breakfast everyday that was the equivalent of lunch for our timing. And it was nice that we could have typical home meals at least once a day. But the truth was that I was craving porridge – the weather was a little chilly and a soupy meal would have hit the spot. Because of the low carb diet, rice is an absolute no-no and the great substitute I discovered some time ago was cauliflower. 100g of rice has about 33g carbohydrates whereas cauliflower only has 3 grams. But the cauliflower needs to be chopped into small pellet sized pieces and although I was much tempted to bring my hand blender with me on the trip, I decided against it in the interests of limited luggage space. So I was completely ecstatic when I discovered this gadget at El Cortes Ingles shopping center at Placa de Catalunya – a manual veggie chopper! 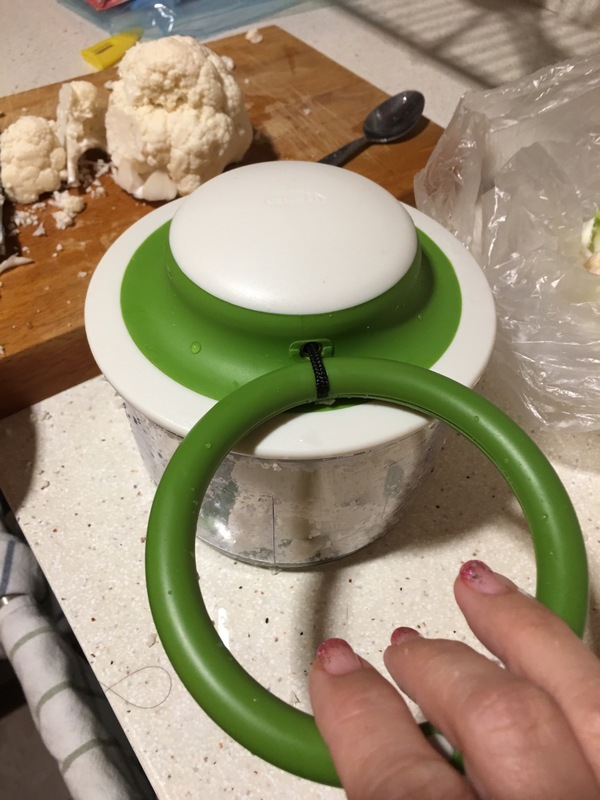 The veggie chopper has a ring attached to a string to pull on, that powers the spinning blades. The veggie chopper made short work of the cauliflower and I got cauliflower rice in a really short time! The rest of the preparation was super easy. 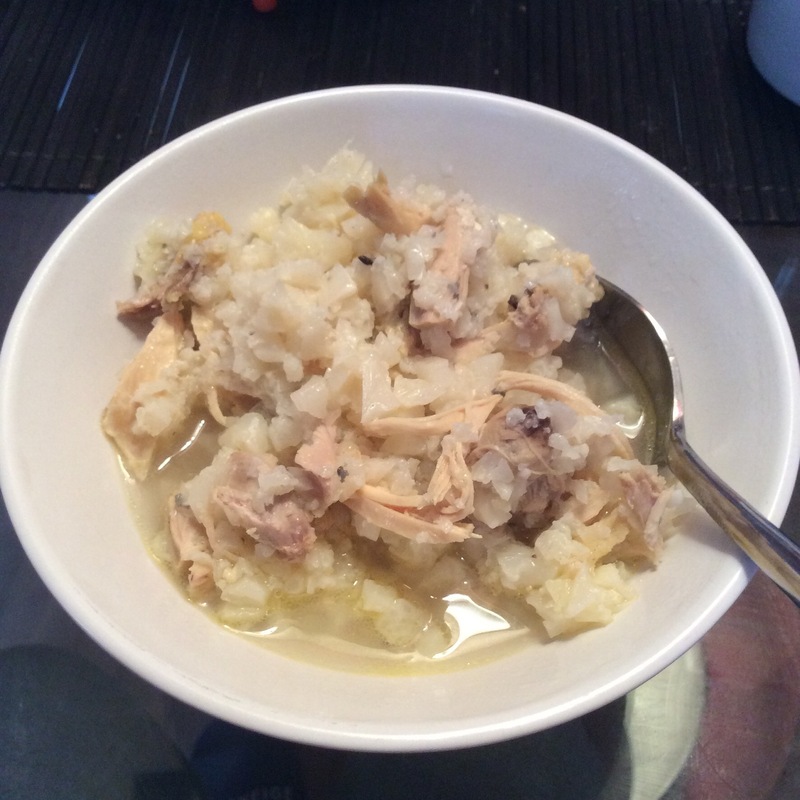 I made chicken stock from scratch, but the process can be shortened if you use store bought chicken stock. In the end, this fed kid#1 and I for breakfast (after a week we didn’t need to make giant meals as we had gotten over jet lag). It was truly a lovely whiff of home and a typical Asian breakfast. Heat up the water in the pot and place the chicken thighs in it. Bring to a boil and simmer for about 15 minutes. Remove the chicken from the pot and debone the chicken, shredding the chicken meat. Put the bones back into the pot and continue to boil, for about 15-20 minutes. In the meantime, chop the cauliflower into tiny rice sized pellets. Add the cauliflower and shredded chicken into the pot. Add the salt and pepper. Boil for another 20 more minutes, adjusting the seasoning and adding water as necessary. The ‘porridge’ should be thick and not too watery, so don’t add too much water.